Regional news channel WGAL (Lancaster, PA) featured Tempo Health on the evening news on November 05, 2014, and focused on the innovation and impact this Aspire venture is making to the lives of Type 1 diabetic children, parents and doctors. 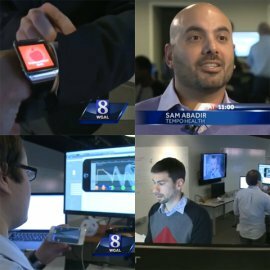 News 8’s Mike Straub focused on Tempo’s work on wearables, doctor and parent information dashboards and the practical impact on the lives of diabetics. The news coverage generated substantial positive reactions in the Susquehanna Valley, as well as in-bound calls and emails, visits by potential new technology and telecommunications partners, and volunteers to participate in future Tempo Health trials. Viewers of the broadcast also received a sneak-preview of the new Tempo Health Acuity App for iOS being launched in December via the iTunes App Store. Type I Diabetes Mellitus is an enormous and growing healthcare problem with costs to individual patients and society escalating exponentially every day which affects more than 350 million people worldwide.